As part of Gökmen Project one of 16 macro projects of our Chamber, it is aimed to endear Aerospace & Aviation sector to the young generation and initiate the basics of the ecosystem in these areas through education. This project is established to strengthen the commencing variation in the industry in Bursa as part of transitioning to Aerospace & Aviation and enable for young generation to be attracted with Aerospace & Aviation sector for it to be consistent so that they could achieve their goals for their future. Gokmen Aerospace and Aviation Training Centre (GUHEM) is designed in cooperation with Bursa Metropolitan Municipality and support from TUBITAK with the intention to prepare a substructure for aerospace- aviation sector. 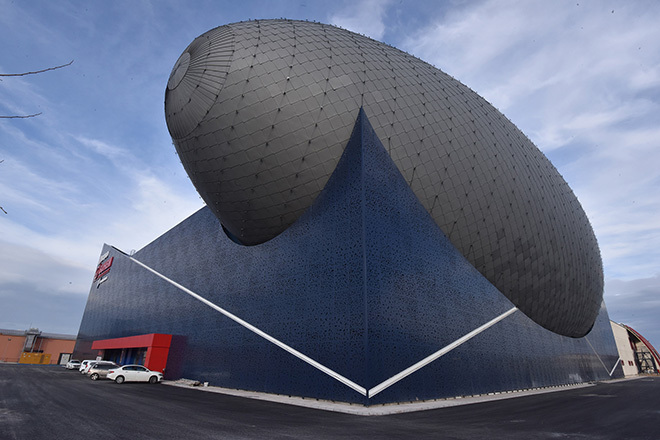 GUHEM as Turkey's first space-themed center constructed on approximately 13,000 m2 indoor area. The complete zeppelin shaped indoor area consists of educational exhibition spaces and mechanisms regarding Aerospace & Aviation. The ground breaking ceremony of the Center was realized on 22 August 2017 which was laid by Mr. Fikri Işık; The then Vice Prime Minister of Turkey and the construction of the center is expected to complete by the end of 2018. It aimed for GUHEM to be one of the best in Europe and one of the best 5 in the world in terms of Aerospace & Aviation Center.